Description Light-bot is back, more puzzling than ever! Use programmer-style logic to tell the bot how to light up all the blue tiles! Functions, conditionals, recursion, expert levels- many different features for new and old players. 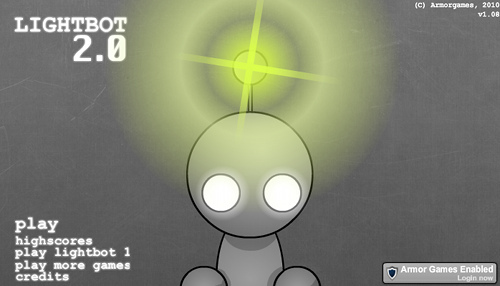 Light-bot 2.0 is a collection of a lot of the ideas I received from the first one and I want to thank each and every supporter of the original game. This would not be the same game it is now without you all! Big thanks to Shael Riley and the Double Ice Backfire (http://www.shaelriley.com/) for creating an addictive soundtrack- one of the songs is a remix of the original Puzzling tune! Controls Mouse - Click to move Commands into the slots on the right. One of the best games for programmers I've ever played. My publish list is empty - one game on it doesn't count. Going to search favorite studios and developers portfolios for new and missed ;) Please help me with Your e-mails and uploads. Thanks in advance!